Through our official housing partner, Eventay, we provide a list of hotels with real time online rates and travel discount for the event. Best Rate Pledge: We operate a "price match guarantee" for rates selling on hotels' own websites. Pay Delay: Ease your commitment - book now, pay later. No Fees: We operate a free hotel booking service. Flexibility: Plans change. We make your adjustments without penalty. Deep Discounts: Buy-in-bulk hotel rates, with savings passed on to you. Real-time Bookings: Book from live inventory and receive immediate confirmations. Reservation Protection: Get peace of mind with support before, during and after your stay. Click on the View Rates to view all the rates available for your stay. Once you have chosen the rate you wish to book, please click on the rate and enter the details required. Contact us on hotels@eventay.co.uk if you need any assistance with your bookings. 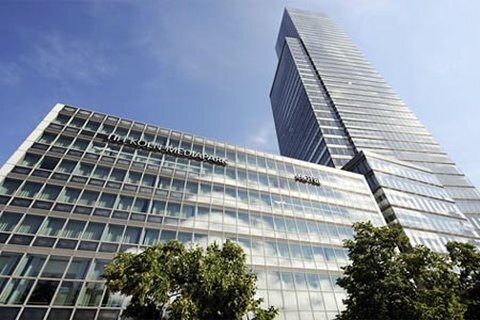 The NH Collection Koeln Mediapark sits in the middle of Cologne’s peaceful green belt, a stone’s throw from the commercial media hub known as the Mediapark. Designed by the celebrated French architect Jean Nouvel, the modern, glass-fronted building looks out across an ornamental lake and is just 15 minutes on foot from Cologne town center with its Gothic cathedral. 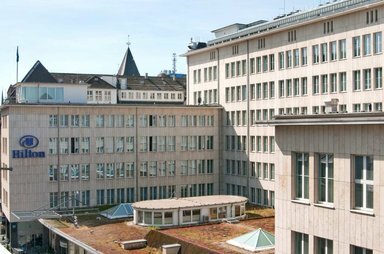 Our owner managed private hotel is in the city centre, on a section of the Cologne boulevard, the Hansaring, with neighbouring parks and green areas. 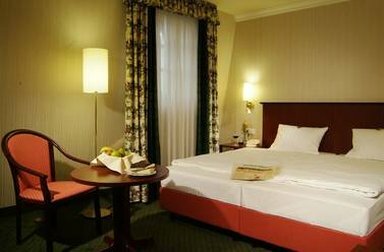 Our 4 star hotel The Ascot is located in the heart of Cologne within walking distance to Cologne Cathedral, the Cologne Ring and the shopping malls of the Rhine metropolis. As a charming boutique hotel we differentiate ourselves from the chain hotels by personal service, individuality and British design. 44 comfortably furnished rooms, among others equipped with air conditioning, tea and Nespresso machines, await you. Within the walls of a former monastery you will spend unforgettable days, feel the spirit of this city and let your spirits flow at our boutique hotel in Cologne. 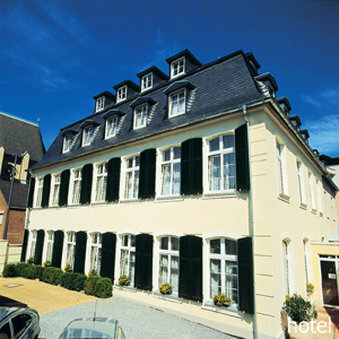 Located in a peaceful side street in the heart of the city, the hotel is a haven of rest and relaxation. With our excellent service full of passion and the outstanding atmosphere of this unique setting you will feel absolutely comfortable, we guarantee. 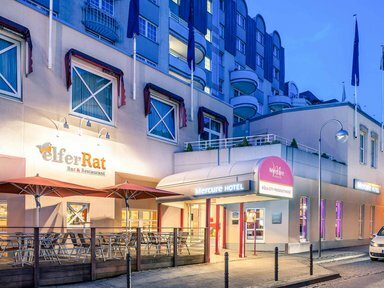 Discover Cologne from up close: The 4-star Mercure Hotel Koeln City Friesenstrasse is located in the heart of the Rhineland city. All 103 rooms have free WIFI. Our CBH-certified hotel is ideal for your meetings with up to 200 people. The four flexible conference rooms are air-conditioned, with WIFI and the latest technology. The hotel is also in an easy-to-reach location. The main train station is 0.6 miles (1 km) away and the airport 11.2 miles (18 km) away. You can park your car in our garage. Stylish elegance within easy walking distance of Cologne Cathedral, the Rhine and the historic old town: You're sure to have time for a spot of sightseeing before or after your meetings. The Pullman Hotel has 265 Superior and Deluxe Rooms as well as 10 Suites. 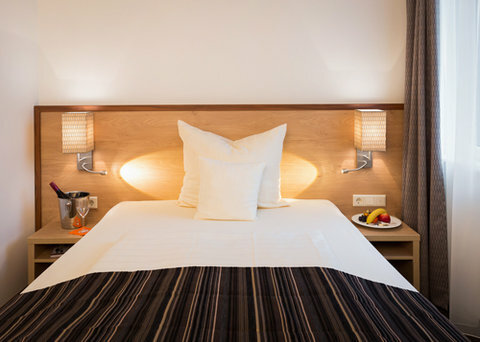 Dom Hotel Am Roemerbrunnen invites you to discover a one-of-a-kind blend of warm hospitality, crisp service and unmatched convenience in the heart of the Cologne Germany city centre. 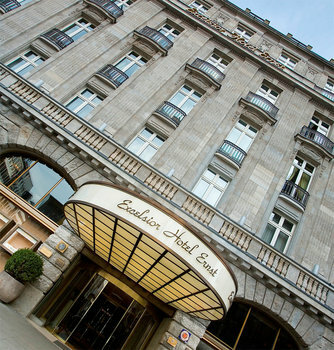 As one of the top boutique hotels in Cologne, we offer a refined yet casual setting ideal for business travel, trade fair events, family holidays and relaxing couples’ escapes. Escape to the Courtyard Cologne, our stylish, modern hotel set in the famous "Eigelstein" neighborhood in the city centre. 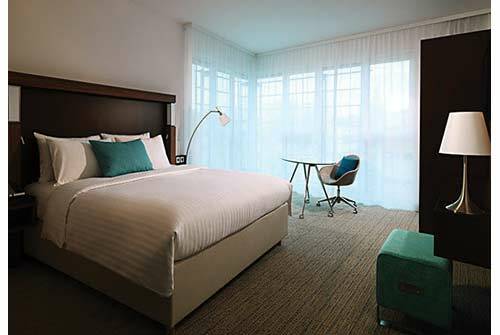 Enjoy our wide range of amenities, from spacious, well-appointed accommodations to on-site dining and meeting rooms. 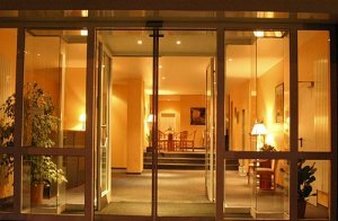 Conveniently located near downtown business offices, the Courtyard Cologne is ideal for business or leisure travel. 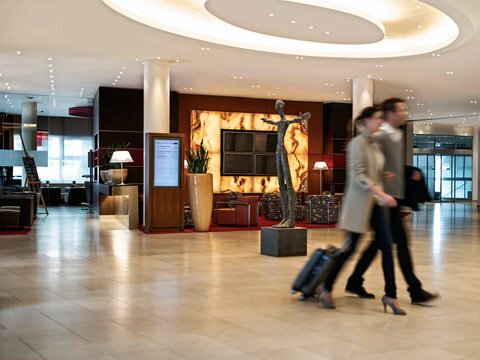 Stay in the heart of the shopping and business district at the designer Hilton Cologne hotel only 11 miles from the airport. Do business in one of 12 meeting rooms then relax at the health club. 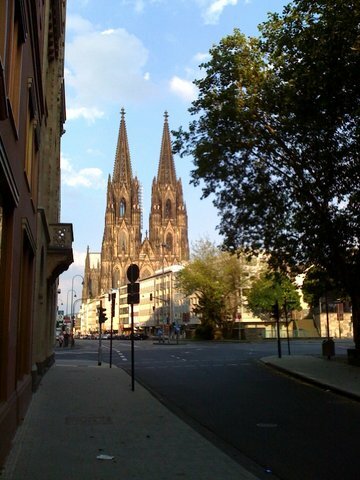 Stroll along the Rhine and see the Cathedral before dinner.Try fusion cuisine at the Hilton Cologne hotel*s konrad Restaurant sip drinks from ice shot glasses at the IceBAR or listen to live piano music in the Lobby Caffe - Bar.Work out in the gym or book a massage at the Hilton Cologne hotel*s Fit - Well Health Club. Cologne attractions include the Old Town Koelner Dom Cathedral and Rhine river cruises.Twenty minutes from Cologne-Bonn Airport in the business district the Hilton Cologne hotel has a 24-hour business center and 12 meeting rooms. 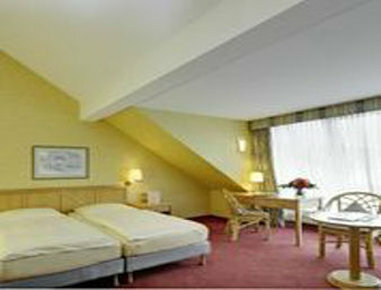 From modern Hilton Guest Rooms to spacious Junior Suites all rooms at the Hilton Cologne hotel offer wireless internet access. SELLING POINTS:- private owned Hotel- only member of the Leading Hotels of the World in Cologne- directly located in the city centre- opposite the famous cathedral- traditional Grand Hotel- TAKU (East Asian Restaurant)awarded one Michelin star-2014 - 200 m to the main station - international ICE trains - 1 km to the cologne trade fair centre - 15 km to Cologne-Bonn airport- 3 km to the highways A1/ A3/ A4/ A57/ A59within walking distance- Cologne Cathedral- Philharmonic concert hall- The old city- Museums and galleries- Cologne Opera house- Renowned theatres- Musical Dome Cologne- Famous shopping streets- Romanic churches- The Treasury of Cologne Cathedral-------------Every July, Germany s largest fireworks, The Kolner Lichter, illuminate the sky over the Rhine. The impressive display is synchronized with music transforming the Rhine into a colorful sea of lights.Sightseeing cruises on the Rhine River is an absolute must for every visitor. On board, you will get the best panoramic view of the most important sites of the city. Tickets and excursions are organized with pleasure by the hotel.